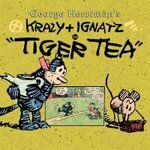 "This season, we offer a unique, stand-alone companion to our Krazy & Ignatz series. The Kat Who Walked In Beauty collects many rare and unique dailies from the 1910s and 1920s. Though many readers are aware of He rriman's dynamic Sunday pages, few know that during 1920, in what must have been an editorially unrestrictive period for Herriman, he drew some of the most graphic and brilliantly conceived daily strips ever created; they look like "mini-Sunday" strips. This nine-month stretch of dailies, never-before-reprinted, is among the treasures included in this collection. The collection includes many other Herriman gems, including the very first stand-alone Krazy & Ignatz strips from 1911, and the illustrations from Herriman"s Krazy Kat Jazz pantomime/ballet, performed to captivated New York audiences in 1922. This book fills in several gaps in the daily strip history, reproduced at close to their original size." All we have to say at this time is, "YES!!!" 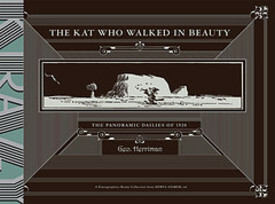 And should you not already be a convert to the way of the Kat, then make your way to Krazy Kat: The Comic Art of George Herriman, with all due haste.